In a large bowl, mix the Arabic powder and 4 oz. of water with a fork for about 2 minutes - pressing on the clumps. (It will look like oatmeal). Cover with plastic wrap and let sit on the countertop overnight. (Do not re-stir). The next day, add the sugar, 8 oz. of water, and the pineapple to a large sauce pot. 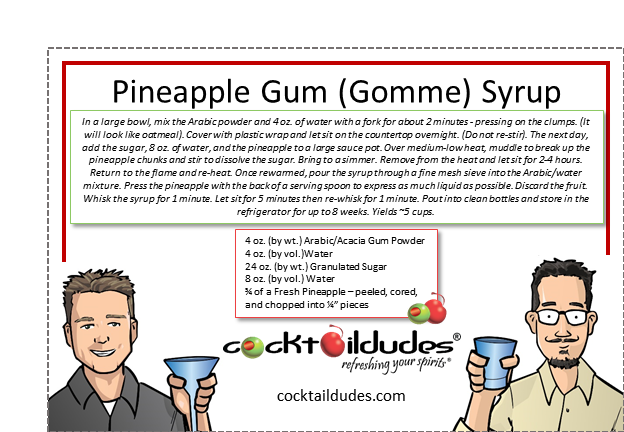 Over medium-low heat, muddle to break up the pineapple chunks and stir to dissolve the sugar. Bring to a simmer. Remove from the heat and let sit for 2-4 hours. Return to the flame and re-heat. Once rewarmed, pour the syrup through a fine mesh sieve into the Arabic/water mixture. Press the pineapple with the back of a serving spoon to express as much liquid as possible. Discard the fruit. Whisk the syrup for 1 minute. Let sit for 5 minutes then re-whisk for 1 minute. Pout into clean bottles and store in the refrigerator for up to 8 weeks. Yields ~5 cups. 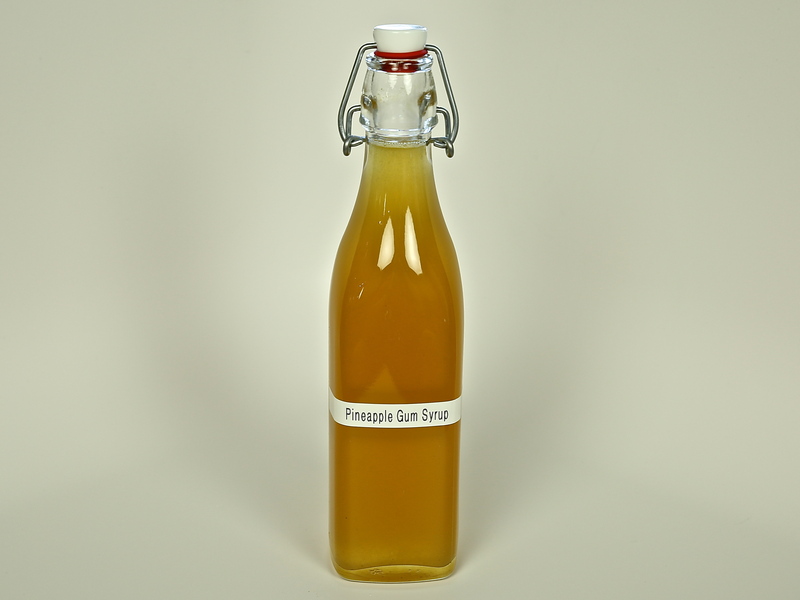 This thick, rich pineapple syrup is the key ingredient in the classic Pisco Punch. Made with Gum Arabic – a thickening agent used in many pre-prohibition era cocktail syrups – it adds a hint of viscosity to the cocktail and allows the flavors to cling to your tongue just a bit longer. 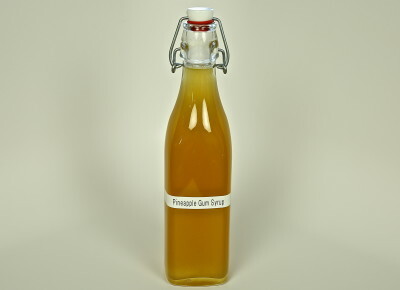 When sitting for a few days, undisturbed in the bottle, the tiny pineapple bits will coalesce, so shake the bottle before using. Enjoy!